Alberto Monteras II has directed TV shows, commercials, live concerts, and over 300 music videos. He's a BFA- Advertising Arts Graduate from the University of Santo Tomas College of Fine Arts and Design. He pursued his passion for filmmaking and studied at the Mowelfund Film Institute, and at the International Institute for Film and the Arts.In 2016, he attended the American Society of Cinematographer’s Masterclass in Los Angeles, California. 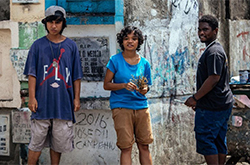 Multiple award winning film Respeto (2017) is his debut film. Hendrix is an aspiring hip-hop artist trapped in a life of low-level crime by his family of drug addicts. A failed robbery brings him and his friends into a redemptive partnership with Doc, an elderly bookstore owner whose life as a poet ended under martial law. The stubborn old man becomes a mentor to Hendrix, encouraging him to find the art in his wordplay. But then the personal becomes the dangerously political. In this era of extrajudicial killings under the reign of the current president, Duterte, here is a film reminding us that true hip-hop is political.